The Landscape Company (TLC) has and is currently servicing the Concord Department of Motor Vehicles since June 2009. Frank McGuire, III and his excellent team of landscapers have proved invaluable with keeping up a very large grass area, pruning/cleaning up litter, repairing sprinklers, and having an excellent open communication with myself in times of an emergency. I can honestly recommend The Landscaping Company to perform a thorough landscaping job to meet anyone’s expectations, as this company has with mine. I am writing this to state the wonderful service that I have received on behalf of The Landscaping Company. They maintain the landscaping on a few of my properties and I have had a very positive experience with the company. They perform excellent work and make recommendations for the enhancement of the landscaping, and their response time is amazing. I have received a call back within five minutes many times. When asked to come to every meeting to explain their proposals, they do so very willing , even though it is at 7:00 pm at night. I would highly recommend this company The Landscaping Company. The Landscape Company is more than just that. They recently completed a $110,000 renovation of one of our pool from demolition through installation of new a cement deck, wrought iron fencing, retaining walls, drainage and backwash system improvements, renovating sheds, and beautiful new landscaping, they did it all. The only “over budget” items were ones that weren’t in the specifications or that were required by code changes. They are as good as their word. I know that I can call Frank and no matter what the question or issue is, he will have an answer, or work with me to find one. I expect to work with them as long as I am a property manager because I respect and value their ethics, their work, and the relationship we have; and most importantly, I know they feel the same. The Landscape Company has cared for one of my HOAs for 28 years, and another for over 10. What sets them apart is their willingness to work with me and the HOA to better the property. We both believe that good communication is the key to resolving problems and to developing the kind of lasting relationship that makes the team stronger every year. They know the property. They know the systems and they know me. It takes all of us working together to properly train crews, set and maintain standards and resolve issues when they arise. And that is our common goal. Years ago we started annual planning walk-throughs in August to identify areas for improvement so we could adequately budget for them in the coming year. When we didn’t have enough to cover a project, payment plans were agreed on allowing the HOA to continue improvements. Whether it is normal maintenance, replacing old landscape, pruning trees, or large improvement projects, they stand behind what they do, bring projects forward, and want to feel proud of the property every bit as much as I do. That kind of commitment matters and it really shows as the property gets better every year. 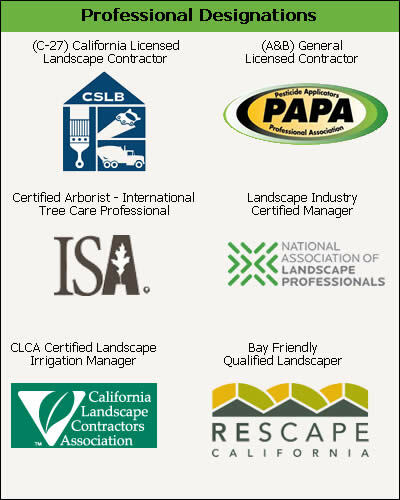 The Landscape Company (TLC) has been our Danville association’s landscape company for the past four years. During this time the landscaping on the property has shown considerable improvements, in both small and large projects. Over this time period, through their focus on detail, they have been able to reduce our water consumption by 25%. Needless to say we are thrilled with the resulting savings. Every employee I have dealt with at The Landscape Company (TLC) is courteous and responsive. When I have an emergency TLC is right there, knowledgeable and helpful. Thank you again for all of your hard and quick response to my association's needs. • Del Monte Foods Inc.